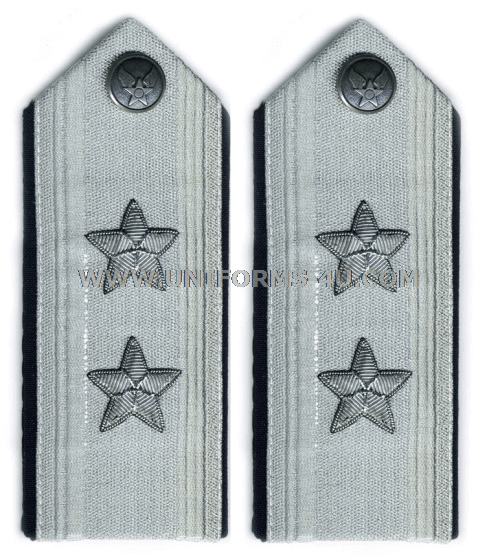 The shoulder boards for Major Generals in the Air Force feature the rank’s insignia of two stars that are evenly spaced between the board’s snap-on button and its outer edge, mimicking the positioning of pin-on rank insignia worn on Air Force uniforms with epaulettes on the shoulders. The stars are oriented point-to-center with a single ray pointing to the neck. Shoulder boards are worn by Major Generals on the Women’s and Men’s Mess Dress and Formal Dress uniforms, which are almost identical in appearance except for the Formal Dress’ lack of chained buttons and the inclusion of a vest rather than a cummerbund. They are attached by sliding the bottom half of the shoulder board through a pair of loops attached to the Mess Dress coat. 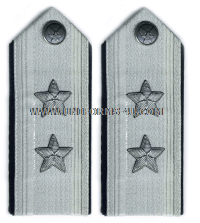 Use the selection box to the right to choose shoulder boards for the Men’s or Women’s uniform.